Timothy Reed’s music runs the gamut from New Age/Classical solo piano, to piano with soaring multi-layered vocals, to comedic songs reminiscent of Arlo Guthrie, to soulful songs influenced by Ben Folds, the Beatles, and Simon and Garfunkel. I was given a collection of poems by people with developmental differences. They were all so interesting and touching, but one especially spoke to me. It was called "Carol's Castle", by Alexis Rhinehart, with help from Katy Elliott. I set it to music for 3 women's voices and piano, making a couple slight changes to the words to fit the flow of the music, and adding a couple words myself, to round out the story of the song. I was really happy with how it turned out. And a huge thanks to Charlea Janette Bailey for the beautiful cover art. 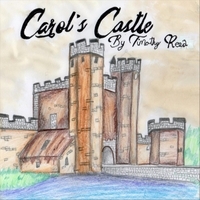 I hope you enjoy this little story of Carol in her castle!